WIN: Rock 'N Learn is giving away a Money & Making Change DVD. Click here to enter now. WIN: CSN Lighting is giving away a Crystorama Floral Mini Chandelier. Click here to enter now. WIN: Agoo is giving away Tushie Huggers. Click here to enter now. WIN: Sony is giving away a Sony Childrens remote. Click here to enter now. WIN: Fantastic Sams is giving away a Fantasticstyle Smoothing Gel, Fantastic Finishing Spritz, and Fantasticstyle Pomade Shaping Wax. Click here to enter now. WIN: Exploramania is giving away a Exploracise Gymathtics DVD. Click here to enter now. WIN: Coghlan's is giving away a Bug-Eye Headlight. Click here to enter now. 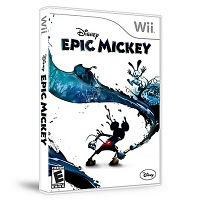 WIN: Disney Interactive Studios is giving away a Epic Mickey Wii game. Click here to enter now. WIN: Pink Cookie is giving away an assortment of Pink Cookie products. Click here to enter now. WIN: Lollipop Moon Boutique is giving away a $25 Gift Certificate. Click here to enter now. WIN: Music Together is giving away a Family Favorites CD Series. Click here to enter now. WIN: Neoteric Cosmetics, Inc. is giving away Alpha Hydrox Products. Click here to enter now. The cookies are eaten, the gifts are unwrapped and it’s time to de-clutter the Christmas fun in the home. That also means it’s time to “de-decorate” and get the house back in order after a fun-filled month of celebrations. The tips I posted over on the SC Johnson Family Economics blog will help you to begin the process: Click here to begin the De-Clutter fun. *Each week Trisha Blogs on SC Johnson Family Economics website as a paid blogger be sure to read her weekly organization articles. MOM Question of the day : What Calendar system do you use? What Calendar system do you use to keep your mom world organized? Click here to read what the moms on Facebook are saying about this question. That's right 24/7 MOMS is taking a 4 day Blog-Cation your in box will be quiet 4 entire days as we take time to hang out with our families and begin preparing for 2011 - More fun, More moms connecting, More ideas, More tips for Moms and More Webcasts to watch. Join us back here on January 1, 2011 as we kick off 2011 another year of traveling the MOM journey together on our blog and on January 11th we will resume airing the #1 Mom Webcast at 7pm PST and 9pm PST. Are you planning a New years eve party or headed off to one and in need of SIMPLE appetizer recipes ? Here are 4 recipes that will quickly become favorites. Mold 1 teaspoon dough around each olive; shape into ball. Place 2 inches apart on ungreased cookie sheet. Cover and refrigerate at least 1 hour. Heat Oven to 400 degrees. Bake until set, 15-20 minutes. Stack the slices on top of each other, ending with the top slice having no cheese on it. Cut into 12 wedges. Garnish with an olive on a toothpick and push into top of wedges. Heat oven to 400 degrees. Unfold pastry onto floured surface. 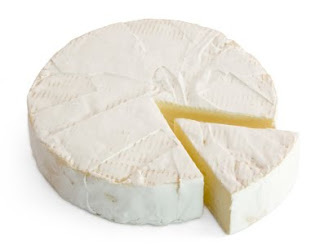 Place cheese and all other ingredients in center. Fold pastry over cheese, bringing excess dough to top and twist to seal. Beat together egg and 1 tsp water. Brush over top. Bake 25 minutes or until golden brown. Let stand 20 min. Serve with crackers. 1. Preheat oven to 375 ° F.
2. Unroll dough, separate at perforations, creating 4 rectangles. Press perforations to seal. 3. With a knife or pizza cutter cut each rectangle lengthwise into eight strips, making a total of 32 strips. Wrap one strip of dough around each smokie slightly stretching and overlapping dough. Place on ungreased cookie sheet. 4. Bake 12 to 14 minutes or until golden brown. Serve with honey mustard, if desired. Do you have a Simple Appetizer recipe? email it to us at trisha@247moms.com to be featured at 24/7 MOMS. A Fun New Years Eve with Kids! Staying home and enjoying New Years Eve with your children can be quite fun. As long as they stay awake. :) Here are some ideas to help make the evening fun! 1. Make bubbly Jell-O according to the directions on a box of Sparkling White Grape Jell-O. Be sure to use club soda, seltzer, or ginger ale and follow the tips on the box for getting the gelatin to sparkle. 2. Chill the Jell-O in champagne flutes or parfait glasses. We suggest making these the day of the party, since they might lose some bubbliness if they're made further ahead. 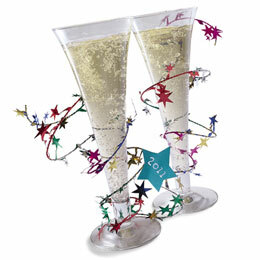 Wind a metallic multicolored star garland (available at party stores) up the stem of the glass for pizzazz. 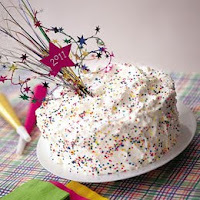 Celebrate New Year's or any special occasion with Confetti Cake. Follow the directions on the cake mix box, but just before pouring the batter into the tube pan, add the sprinkles. Mix them quickly and gently with as few strokes as possible and pour the batter into the pan immediately. If you mix and pour too slowly, the colors may bleed and color the surrounding batter. Make the frosting right before you plan to apply it so that it doesn't set. For best results, apply the frosting, sprinkles, and decoration no more than an hour before serving. Combine the gelatin and water in a small saucepan. Let it stand until thick. Set the pan over low heat, stirring constantly until the gelatin dissolves. Don't let it boil, as that would reduce the gelling power of the gelatin. Remove the gelatin from the heat. While it cools a bit, combine the cream, sugar, and vanilla extract in a bowl. Whip them with an electric mixer until the mixture thickens slightly. Gradually pour the liquid gelatin (don't let it set) into the whipped cream mixture and continue to beat at slow speed until blended. Then whip it at high speed until it's stiff and peaks form when you lift the beaters. Frost the completely cooled cake with a generous, fluffy layer, making swirls and peaks as you go. Add confetti (colored sprinkles) and the sparkly year decoration. (Tip: We applied the sprinkles to the sides of the cake by lightly tossing them against the frosting. After we stuck our store-bought metallic sprays entwined with a star garland into the cake, we cut a 2-inch star out of paper, wrote the year numerals on it, and taped it to the sprays.) Store the cake in the refrigerator until ready to serve. You can count on our shiny hats to make the ideal toppers for a New Year's party, but there's no reason to confine them to the countdown. Tailor the decorations to the mood and theme of your holiday party: glue on large menorah-shaped sequins (available at party supply stores) or festoon the hats with mini candy canes. Note: not all these materials are required to make each hat. To make a cone-shaped hat, cut a semicircle with a 14-inch diameter from the poster board. Roll it into a cone, adjust its size to fit the child, and seal the seam with double-sided foam tape. To make a chin strap, use the thumbtack to poke a hole through each side of the hat near the bottom, thread one end of the elastic through each hole, and knot a few times to secure it. To make a headband-style hat, cut out a strip of poster board about 26 inches long and 3 to 7 inches wide (depending on your design). Cut a decorative design along one edge of the strip, fit it around the child's forehead, and secure the seam with two large paper clips. 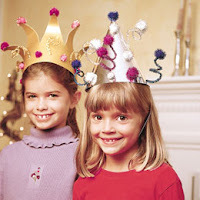 To decorate the hats, wrap pipe cleaners around pom-poms to make antennae or coil them around a pen to make spirals. To attach a pipe cleaner decoration to the hat, use the thumbtack to poke a hole through the hat, push 1 inch of the pipe cleaner through the hole to the inside of the hat, and duct-tape it down. Attach pom-poms to the hat with double-sided foam tape. 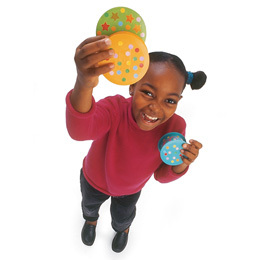 Help your child recycle empty ribbon spools into colorful noisemakers for New Year's Eve. For each one, first see if the holes in the sides of your ribbon spool are covered by the ribbon's labels. If so, use a pencil to poke through the label over 1 of the holes; if not, cover 1 hole with masking tape. Next, pour a handful of dried peas or beans into the spool through the open hole, then seal the hole with tape. Coat the shaker with acrylic paint, let it dry, then decorate it with colorful stickers. 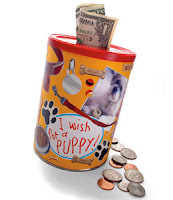 Ring in the new year with a project that your child can bank on: a custom container that lets him save up for something he really wants. Have your child decorate an empty coffee can with images of what he pines for. Then cut a slot in the lid that's large enough to accommodate coins and folded bills. Make the first deposit to get him started. On New Year's Eve, invite your kids to write a letter to their future selves. They can list their favorite things (books, songs, ice-cream flavors, TV shows, foods, colors, animals, games) and make predictions (how tall will they be in a year?). Pack away the letters with the holiday decorations so that they'll be out of sight but easy to find next year. On December 31, 2010, have your kids open their letters and see how much their tastes have changed -- or haven't! A New Year's resolution is a promise that one makes to a scheme or the improvement of a custom, frequently a way of life transformation that is usually construed as beneficial. The name comes from the detail that these promises in general go into an upshot on New Year's Day and stay in anticipation of satisfaction or discardation. New society concerned examples comprise resolutions to contribute to the poor more repeatedly, to turn into more self-confident, or to develop into more economically or environmentally accountable. People possibly will act likewise during the Christian fasting period of Lent; however the purpose at the back of this festival is more of sacrifice than of duty. The New Year resolution is one instance of the undulating forecast-method of preparation. As per this system, plans are recognized at regular short or medium-term time intervals, when only an irregular long-term plan exists. There are spiritual equivalents to this worldly custom. For example, during Judaism's New Year, Rosh Hashanah, throughout the High Holidays and concluding in the Day of Atonement, or Yom Kippur, one is to think of one's misconducts of the year and both look for and offer forgiveness. The idea, in spite of the faith, is to reproduce upon self-improvement yearly. It must be computable AND definite. In other words, an absolute unfamiliar person should simply be able to objectively conclude whether or not you've accomplished it. A procedure of events should be necessary in order to attain it. "Visit Kenya." doesn't count if one usually travels and it's within the financial means and ease zone. It would count, however, if one had to come up with some way of financing the journey, or if one moved there for a month, or if one was having a preexisting catastrophe about hippos and were going there to tackle the fears. - Try to dream up at least a goal or two in each area of the life. Don't just aim at losing weight and give up smoking. Think of new pastimes, the delicate relationships, the reading habits, the learning status, and so on. Good: "Weigh 134lbs naked on the morning of December 31"
Awesome: "Run three miles without stopping wearing XXS Aerie sweatpants"
The overwhelming description of this decision not only fit in two general goals -- losing weight and exercising more -- into one, but it also aim at one of the genuine cause one wants to lose weight: to fit into a smaller clothing size. It doesn’t matter what number the scale shows if the pants won’t fit! One may not be capable to chart out the concluding end of the trip right now. That's okay. The significant thing is that one has at least one action step that he can take RIGHT NOW in the direction of each of the resolutions. Current study shows that as 52% of participants in a resolution study were sure of achievement of their objectives and resolutions, only 12% in fact attain their objectives. Men attain their goal 22% more frequently when they occupied in a goal setting, an arrangement where small quantifiable goals are used (lose a pound a week, in its place of saying "lose weight"), where as women do well 10% more when they made their resolutions open and got support from their companions. NEW Pretzel Dips from Dean's® Dip, the #1 Dairy Dip brand! High in flavor but low in calories, the creamy goodness of these tangy dips is the perfect partner for salty pretzels. Add a sweet twist to a savory pretzel! This classic pretzel dip made with real honey and Dijon mustard is a low-fat snack worth savoring! Try it on pretzel twists, sticks, or chips. Also great with other finger foods like chicken nuggets or egg rolls. The tangy flavor of cheddar cheese adds a zesty zip to pretzels or chips, crackers or baked potatoes. SHOP:Click here to visit Dean's Dips website. Dean's Dip website is a great resource for Entertaining Ideas and Recipes. WIN: 24/7 MOMS and Dean's Dips are giving away a Deans Dip party pack complete with Deans Dip blanket, Deans chip clip, Deans flip-flops, Twister, Mini-pretzel tin,re-usable bag and Free Deans Dip coupons. US entries only and one entry per person. Winner will be chosen on January 8, 2011. **This is a sponsored post Deans Dips. We also received a Deans Dip party pack for review. Q: What is your favorite thing to do in the snow? Q: What did the fly say to the flypaper? A: "I'm stuck on you." Another big Christmas celebration is over and the Novotny chef also known as the Dad and Husband in our home cooked a fabulous Prime Rib dinner. Now it's time to take our left overs and create meals that my family will enjoy. Below are a few simple and yummy recipes for Prime rib leftovers. What will you create with your Christmas leftovers? Make au ju according to package. Add sliced prime rib to au ju. Places desired amount of sliced prime rid onto sandwich rolls. Serve with individual bowls of au ju for dipping sandwich into. Add cut-up prime rib to gravy. Season the steak strips with House Seasoning, then dust with flour. In a large skillet, quickly brown them on both sides in the olive oil and butter. Remove the steak from the pan. Add the onion slices and mushrooms to the pan drippings. Saute for a few minutes, until the onion is tender. Sprinkle with 1 teaspoon flour. Put the steak back into the pan with the onion and mushrooms. Add the mushroom soup and beef broth. Cook over low heat for about 30 minutes, covered. Adjust seasoning to taste, adding salt and pepper, as needed. Stir in the sour cream the last few minutes, right before you serve. Serve over cooked noodles. Put all ingredients, through parsley, in a large pot. Cook over medium heat for 1/2 hour. Add barley and cook for another 1/2 hour. Remove bones from pot & cool. Remove meat from bones & cut into pieces. Return meat to pot and then add potato and mixed vegetables. Cook 1/2 hour or until potatoes are cooked. Notes: *If bones are not left over from a cooked roast, be sure to season them and brown them in the oven before making soup. Shopping Deal: Click HERE to view the clearance selection of large Yankee jar candles priced at $15 each (from $24.99) or 2/$25. Use code: V5QKP1J and get $10 off $25+ with flat rate shipping of $5. You'll pay $20 shipped for two! Thanks Moms By heart for this deal. Luvs Baby Diapers, a trusted name in baby care, has unveiled a new look for their diapers, which will offer consumers upgraded packaging features and a new Heavy Dooty Protection diaper design. The new additions are purely aesthetic and will not affect the performance, quality or value parents expect from the Luvs brand. After soliciting feedback from current users, Luvs will be replacing the backsheet currently found on their diapers with an adorable, new monkey design – a look that is preferred three-to-one over current designs by those surveyed – enhancing the diaper-changing experience for parents. Consumers will also be treated to a diaper packaging upgrade that will consist of new, updated photography and an added back package panel that will provide parents and caretakers with additional product information. 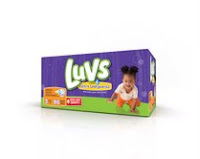 While the look may be new, the diapers will still be comprised of the same trusted and safe materials used in all previous versions of the product – and will still have the same performance, quality and value parents have come to expect from the Luvs brand. WIN: 24/7 MOMS and Luvs are giving away one pack of size 4 Luvs diapers, featuring the new Heavy Dooty Protection design and upgraded packaging. **We received a complimentary Luvs diapers for review no financial compensation was received. Q: What did one arithmetic book say to the other arithmetic book? A: "Boy, do I have problems!" Merry Christmas From 24/7 Moms. As you spend today celebrating the birth of Jesus listen to this song with your family and be reminded that Jesus was born long ago for you and I. It's Operation wrapping at the Novotny house - as we wrap , label , wrap, label -I begin to wonder if I'll run out of supplies, just in case I have kept a list of places I can get FREE printable Christmas Gift Labels just ion case I am in need of them today. 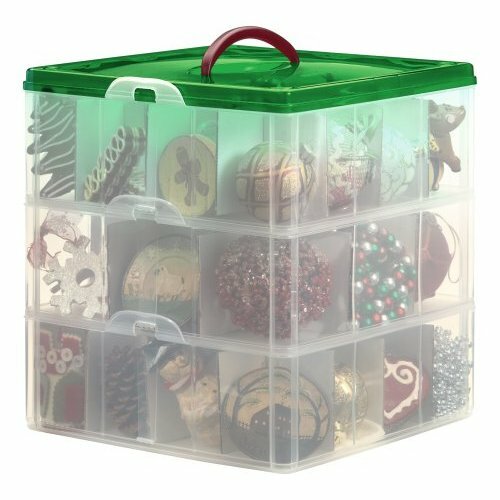 Delight.com has an fun assortment of FREE labels. Click here to go there now. Holly Jolly FREE gift labels. Click here to get yours now. The Paper Seed free gift tags. Click here for free tags. It's Christmas Eve and your children are ready to place either plate of cookies and glass of milk out for Santa but what about those hard working Reindeer? I think they might get a bit hungry tonight and need to nibble on something while Santa unloads his sleigh at your house tonight. I found a DIY (do it yourself) recipe for Reindeer food over at Today's Creative blog. Your kids will love making this and you can even make a few extra batches to share with your neighbors if you choose. 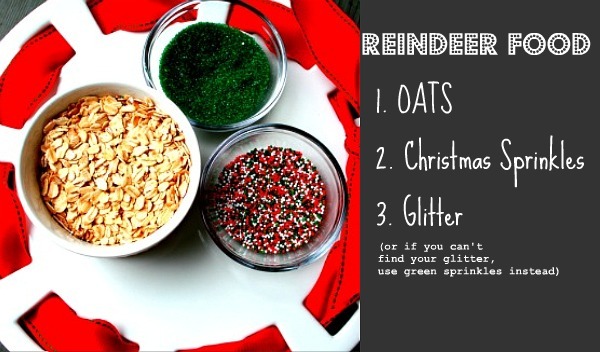 Click here to get your DIY Reindeer food recipe.